Yesterday, my Google calendar was so packed, it didn’t all fit on the screen. First thing…a phone conference with a potential Day Of wedding planner. It is clear to me that I want someone else running the show that weekend and finding the right person and one that I can afford will take some effort. At the same time, I got this week’s lunch into the crockpot. I got a new crockpot yesterday (which has me super excited) but I didn’t have it cleaned and ready to go yet in the morning. By the way, have you heard about the new wireless crockpot? I will be registering for one FOR SURE and perhaps changing the title of my blog to Crockpot Queen : ) Crockpot brand if you’re listening…I’m happy to be a tester for you!!! Next up, I was excited to get my sweat on for my weekly training session but had to wash up quickly to meet a DJ for a wedding interview. Two and a half hours of music and lighting talk later, I was thoroughly overwhelmed and yet super excited for our wedding which is over a year away. I had barely enough time to walk in the door and shower before my mom scooped me up (since I wasn’t ready she kept busy playing with her favorite kitty). We drove out to Geneva to meet up with friends at All Chocolate Kitchen. I have heard only amazing things about this place and was psyched to dig into my dark chocolate sea salt gelato. It was unbelievably tasty! And there are plenty more things for me to come back and try. We had to eat and run to make my 4pm appointment to try on wedding dresses. This appointment was way more successful than my first appointment and I found a few dresses that I liked but I’m still looking. After dresses, I had one last appointment with another planner…Ahh! It was a long day! I had the BOY’s help in finishing up my crockpot meal, which turned out fantastic! Needless to say, I crashed into bed last night. In slow cooker, stir together garlic, bell pepper, crushed tomatoes, chicken, broth, onion, 1/3 cup cheese, basil, oregano and red pepper flakes. Cook on high 3-1/2 hours or on low 7 hours. Transfer chicken breasts to cutting board and coarsely shred; return to slow cooker. Stir in pasta. Cook on high 30 minutes longer or until pasta is cooked al dente. Serve garnished with extra Parmesan cheese and chopped basil or parsley. *I think that you could add in spinach! What do you think about a wireless crockpot? Although I have been Lazy No More IRL (in real life), that has not applied to my blogging…Sorry friends! What have you been doing lately? Melt white chocolate chips in a double boiler or microwave, stir until well combined. Pour half of the melted white chocolate and 1 tsp of apple pie spice onto the cereal, mix then pour the remaining chocolate and apple pie spice. Continue stirring until Chex cereal is evenly coated. Coat cereal with powdered sugar. I start with 1 cup of powdered sugar and slowly add another 1/2 cup if desired. Eat and Enjoy! Store in Freezer…yum! Although parts of me LOVE a little time off…my skinny jeans don’t (or any of my pants, really! ), so after a few weeks of extra sleep, ice cream, and wine it was time to get back to my healthier routine. Yesterday morning, when my alarm went off I was out on the path for a pre work run. I had to work yesterday in order to take Thursday off for the holiday. Then this morning, after some serious cuddles with Cooper, I was out the door in the pitch black for the 6am strength class that I haven’t been to in a LONG time. I know that I will be sore tomorrow, but it was great to be back! After a long day of work, I came home to pack my bag and bake up a sweet treat for the start of the Jewish New Year! I needed an easy, few ingredient recipe that I could throw together quickly tonight, and of course I found that on Pinterest. Our house smelled fantastic!!! Like warm butter and cake batter…yum! Looking forward to digging in tomorrow and celebrating the start of an exciting and active new year with my family! Preheat oven to 350 degrees. Spray the bottom of a 9×13 pan with cooking spray. Layer in apples, cake mix, and then drizzle with butter. Bake for 35-40 minutes. Serve warm with ice cream. And this last week has been one of those lazy times! I’m sure my definition of ‘lazy’ is a little off the actual textbook definition of lazy. But compared to my typical activity level, this last week plus has just been lazy. Minus the half marathon of course (although even my training for that was a bit lazy). I’ve been lazy about my blogging…lazy about my workouts…lazy about cleaning my house…you get the drift! The thing is that because I am usually on the go, I figure that my body and mind need a little break sometimes. So I give them a break, try not to feel too guilty about it, and then pick up the pieces and move on. Until then, I’ve been keeping myself busy with Starbucks runs and Cooper cuddles. Today was one of the laziest days of all…I didn’t even shower. I did make it to the grocery store and we made our first crockpot full of chili of the season. So after a lazy week, I’m ready to move forward with a healthy meal plan, exercise, and the start to the Jewish new year. Wednesday: Home for the Holidays! Do you ever feel lazy? My legs were definitely lecturing me this morning on the importance of proper training. Although I was able to walk, from my first step, my hamstrings were screaming with every step. They toughed it through my strength workout this morning because we focused only on arms and back. Then, my body got the TLC that it needed with an incredible massage. So I’m sure you’ve already figured out that the title of this post is referring to my favorite kind of pot…the crockpot. This afternoon, I tried an experiment. I took one of the best and easiest crockpot recipes that I know and combined it in a ziploc bag. Since the BOY is home tomorrow and I work, he can easily throw everything into the crockpot in the afternoon and dinner will be ready when I get home. I know that there are a lot of people who freeze their crockpot recipes ahead of time and I am beginning to see the appeal. 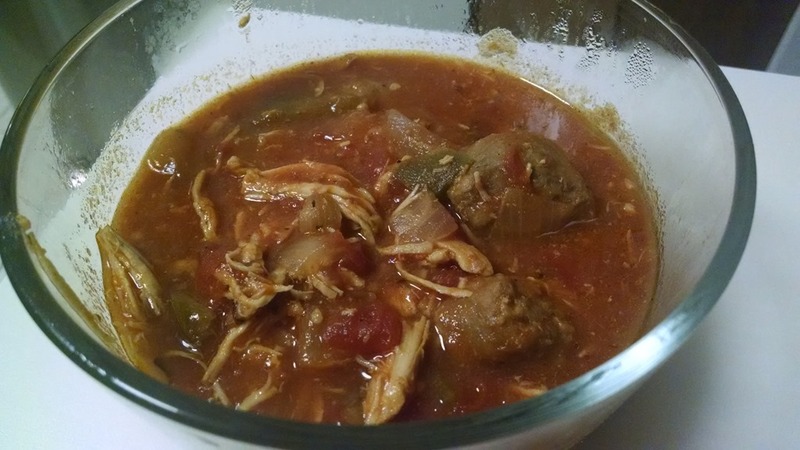 It would be easy to double a recipe, throwing half in the crockpot and half in the freezer for a later date. Once I had the peanut chicken stored in the fridge, I moved onto this week’s lunch. A Pinterest find from the recipe geniuses over at Pinch of Yum. The weather is just chilly enough for me to start craving soups and stews. What attracted me to this recipe was the spices and flavors. When I walked in the door after my dinner date with a friend, the house smelled heavenly. Sadly, I will have to wait tomorrow for my first taste, but I’m sure it will be wonderful. A lot of goodness can come from ONE POT! What are you excited to make this fall? What is your favorite make ahead recipe? Optional extras: check out the website to see what else you can use! *I would also consider adding in some okra…Yum! Place the essential ingredients in the crockpot. Cover and cook on low for 6-8 hours or high for 3 hours. Shred the chicken directly in the crockpot to your desired texture. Add the extras, if you want, and cover and cook for another 20-30 minutes. When everything is ready, taste the chicken mixture and season with salt. Serve the creole chicken over rice and topped with green onions. So I feel like there were points leading up to this race where I feared it would be my first DNF (did not finish). My training was either non existent (ie weekend in Memphis) or poor. I struggled to get through my long runs and my heart just wasn’t in it. Yet when I woke up this morning, I was ready for whatever the day threw my way. It certainly helped that my my parents met me at my house so we could drive together to the race. The BOY, who is still sick, got to sleep in. What made this well-organized race so fun was the ease of getting there, the lack of crazy crowds, and the laid back vibe. It’s actually at the same location where I ran the Hot Cider Hustle last fall. Even better…the weather was PERFECT for a run! I easily found my friend and was looking forward to catching up again. We’ve done a bunch of bike rides and runs together this year, including the Soldier Field 10 Miler. About 5 minutes before the start of the race, we found our way to the start line. I didn’t have a set plan, which is so not like me, but figured I would find a steady pace and do the best I could. I was so disorganized that I almost didn’t start my watch at the start. The course weaves through a beautiful forest preserve. My friend and I found an easy pace of running and conversation. I was surprised at how good I was feeling as I trudged along. I barely looked at my watch so I had no idea what my pace was but I still felt decent as we passed the 9:10 pace group with about 3 miles to go. In the end, I even found a little kick as we raced to the finish line where my parents were waiting with cameras finishing just under 2 hours. 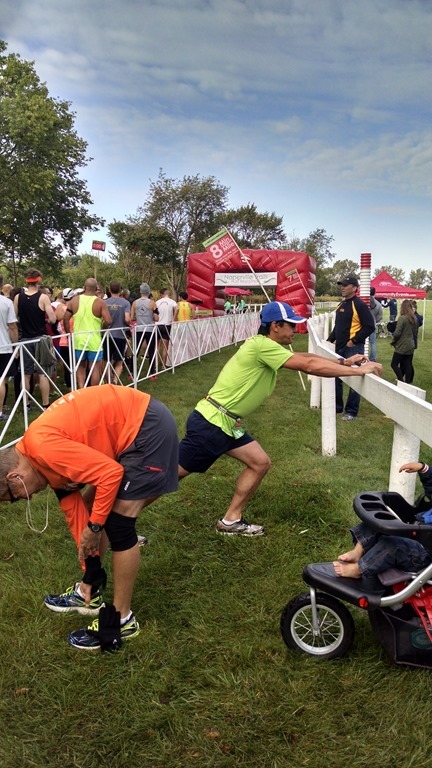 Although I didn’t train to PR this race, I also didn’t want it to be my slowest race ever. I was pleasantly surprised that I was able to maintain a 9:05 pace and finish feeling pretty darn good. The reward was lunch at Naf Naf. The BOY’s choice but since he couldn’t join us we sent pictures! I spent the rest of my afternoon walking around the mall with my mom, which was probably great for my legs and sipping on Starbucks chai tea. Now I am planted on the couch watching the Bears game and beginning to feel all of my muscles talk to me. Thankfully, I have a well timed massage scheduled tomorrow! Because then you would all see how crazy we are! So this morning when he woke up around 5am because he is sick and couldn’t sleep and came downstairs to discover that his precious, most prized possession La-Z-boy was broken, things got a little out of hand. There was some hammering, some flipping of the chair, and some more construction. All of this drove Cooper into tizzy causing him to come whining loudly and incessantly at my door. Until I opened the door, where he jumped onto my pillow allowed me to pet him a few times before biting me. Which got him immediately removed from the room by the BOY who was eager to come share the tales of his morning. People…I couldn’t make this stuff up if tried! I told the BOY that he needed to feed Cooper (‘but it’s only 6am’…’yes that’s what time I wake up every day and feed him’). The BOY moved himself and all of his possessions taking over my couch and Cooper was able to scarf down breakfast in one bite. Feeling calmer, he returned to my room. After exploring the entire room twice, he finally curled up between my legs where we both fell back asleep. Around 8am, when I finally woke up for real, the BOY returned to bed stating that he needed to be woken up at 9:20 so that he could be the first one at the La-Z-boy store when it opened at 10. I whipped up French Toast for breakfast and brewed a strong pot of tea! I don’t know about where you are, but we’ve had a cold spell. It’s supposed to be 60 degrees this weekend but it’s been much more chilly than that the past few days making it the PERFECT morning to bake my #firstloafoftheseason of Pumpkin Bread. I found this recipe on Pinterest (in between pinning wedding ideas). With the BOY asleep and my eager assistant chef busy searching for hidden treats, I got to work. This recipe makes 3 big loaves which was perfect…one for us, one for my friend running with me tomorrow, and one for the birthday party I’m going to this afternoon. I didn’t have enough oil, so I subbed in applesauce. This recipe is really easy and has lots of spice (my favorite) so perfect for a Saturday morning breakfast. I popped my bread in the oven, eagerly awaiting the smells of fall, and happily settled onto my couch for a a Law&Order marathon. Preheat oven to 350 and grease 3 loaf pans. Mix the pumpkin, oil, sugar, and eggs. Combine the dry ingredients and then stir into the wet mixture. Pour into pans and bake 45 min. or until done all the way through. 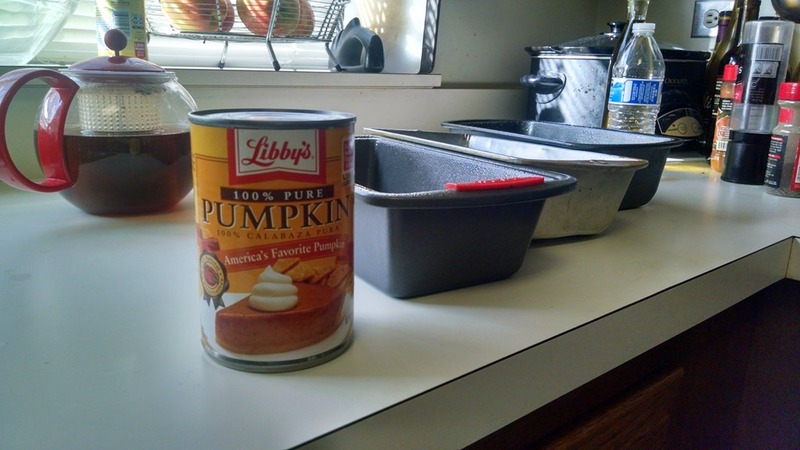 Have you made anything with pumpkin yet? Welcome to my page! I am a 30 year old living in suburbia struggling to balance a full-time job in health care, healthy eating, and exercise along with all the other fun things I enjoy. I love to bake, run, travel, practice yoga, take pictures, cook, and share it all with you.